HP's Compaq range targets the corporate user and small businesses, offering robust build quality and a conservative but practical design. 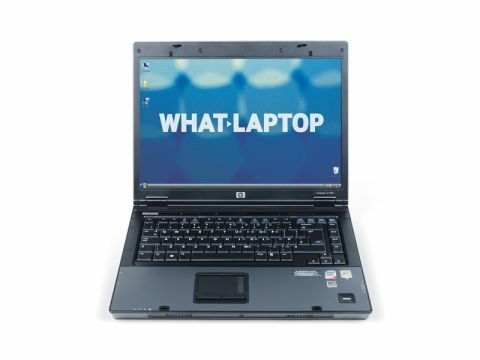 The HP Compaq 6710b (£699 inc. VAT) features a 15.4-inch display. It uses standard TFT technology – so the display has a matt ﬁnish rather than the glossy coating found on rivals. As such, it's much easier to use out on the road, where reﬂections are kept to a minimum. There are also no compromises made when it comes to colour reproduction, with bright and vivid images on offer. Having said that, the 1280 x 800 pixel resolution looks a little large on a machine of this size, and images could be sharper. As with many business machines, graphics come courtesy of an integrated chipset, so you won't be able to carry out intensive video editing work or play games in your spare time. It's more than capable for everyday applications, however, and it helps to offer an impressive battery life of 281 minutes. The keyboard is great – it's not as quiet as previous Compaq keyboards, but the keys are of a good size and it's easy to type at speed. Offset directional and peripheral keys make it easy to navigate a document without looking at the keyboard. The 6710b is constructed from dull-looking grey and black plastics, but the quality of this machine is beyond reproach. The chassis offers good protection for the components, and the thick screen surround is equally robust. At 2.9kg, it's not the most portable of laptops, but we didn't have any trouble carrying it around for short periods of time. You'll ﬁnd a high-end Intel Core 2 Duo processor in place, running at 2.4GHz. Along with 2048MB of memory, it offers enough performance for effortless multitasking. The processor makes up part of Intel's previous-generation Centrino chipset, which also features an older 802.11a/b/g Wi-Fi adapter. This offers slightly slower connection speeds than the 802.11n wireless card found in most of its rivals. Gigabit Ethernet is in place for the fastest ﬁxed network connections. Storage space – at 160GB – is below average in this company. Other features are more generous. You'll ﬁnd a biometric ﬁngerprint scanner for added security, and a comprehensive software suite that includes Roxio's Easy Media Creator, letting you back up your ﬁles to CD or DVD without the need to buy additional software. The HP is not great value for money, but the strength and usability on offer may make it worth a second look for those seeking a corporate laptop.